Last June we shared the story of the Abudabaya Orthodox Jews of Putti, Uganda. Now we're updating the story with a video of the arrival of a new sefer Torah for the community. This is a truly amazing, unbelievable but true story about how a 51-year-old Jewish spinal surgeon from Plano, Texas, was successful in getting and delivering a Torah scroll to the Abudabaya community. To get the full impact of the story, you should read the coimplete article from the Dallas Post and Courier, which we link to here. The Abayudaya community was founded in the 1920s by Ugandan warlord Semei Kakungulu, who rejected the Christian teachings of British missionaries and converted to Judaism. After circumcising himself and his sons and ordering his male converts to follow suit, Kakungulu compiled a book of rules and prayers for members of his tribe. In it, he demanded strict adherence to commandments in the Old Testament. Judaism thrived in Uganda, even after Kakungulu’s death in 1928. When Ugandan dictator Idi Amin came to power in 1971, he outlawed Judaism and threatened to execute anyone who practiced the religion. The decree fractured the Abayudaya and forced its most loyal adherents underground. Freedom of religious practice was reinstated after Amin was deposed in 1979. 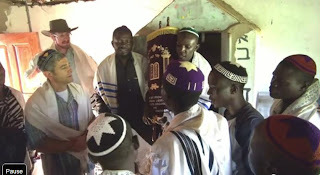 About 1,500 Abayudaya Jews live in villages in eastern Uganda today. Now that you know the story, watch and enjoy the video of the joyous celebration in Putti when the Torah was delivered by Dr. Lieberman.